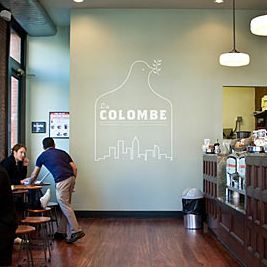 Seven new locations are already signed and in progress, he says, and will be for the most part in markets where La Colombe is already open — Philly, D.C., Chicago, and NYC, where one is opening in Hudson Square. Other projects include a much-hyped rum distillery in Philly. The latest growth spurt for the 20-year-old company closely mirrors the recent move by Blue Bottle, which landed a $25 million investment earlier this year to underwrite a serious bicoastal expansion and foray into the subscription-model business. Carmichael also says a move into the Northwest’s hallowed coffee territory, Seattle in particular, is certainly possible. Sounds about right — his new coffee brewer that looks just like a bong will fit right in.